So we went to Jordan. The first day, we arrived at our hotel in Amman and realised that what we would ‘normally’ do is walk around, find a nice cafe and have a drink and a bite to eat. Obviously this was not on the agenda (it’s Ramadan remember? ), so what did we do for the next three days? Let’s just say that we sat in our room and ploughed through our 4 litres of duty free alcohol from the airport fairly quickly. In retrospect we should have rationed it out, but oh well, it was nice while it lasted. We didn’t stay in the hotel room the whole time. We did go out for dinner to break our ‘fast’ and had some wonderful meals. We also went out for a few walks, just to feel the vibe of the city but it really was almost shut down during the day, so not much vibing going on. 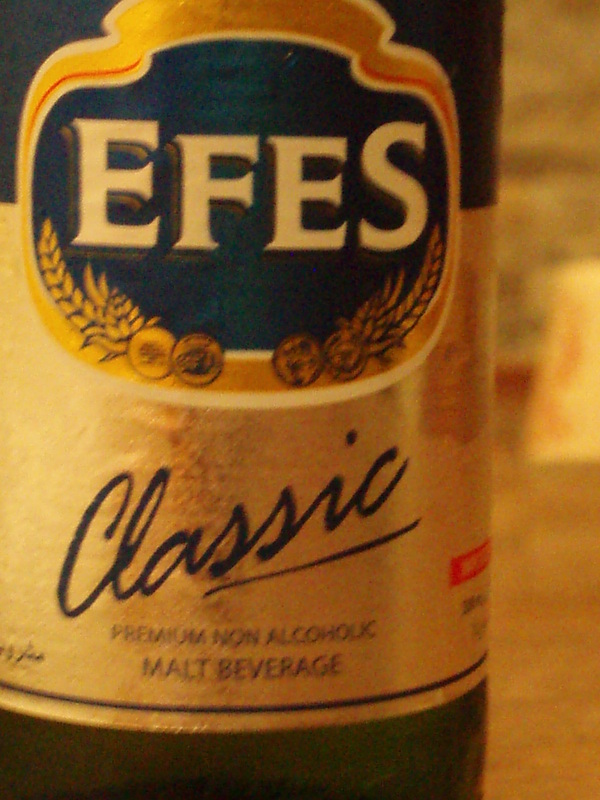 During one of these walks we came across a little convenience store where we stopped to get some naughty non-Ramadan sanctioned snacks and drinks and while shopping we noticed some Efes beers in the fridge (for those of you who have read Ejo#8, you’ll remember that Efes is the national beer of Turkey). We were super shocked that a store would be selling beer in the middle of the day during Ramadan as it’s illegal in Jordan but we certainly weren’t going to complain. We picked up a six pack and trudged back to our room for some decidedly non-Ramadan eating and drinking. Popping open the bottles, the excitement was rife. We cheered, had a little celebratory kiss, and gulped away ready to be transported to beer heaven… only to stop drinking, make a face and say, ‘It tastes funny.”. Further inspection revealed… well, let’s just say that I will always double check the label from now on (to make sure I never again subject myself to the horror of non-alcoholic beer). To say we were disappointed would be making a gross understatement. By the time we got to Petra we were feeling like we weren’t really giving Jordan the attention it deserved and decided to act like real tourists(for once) and see all the sites in the area. 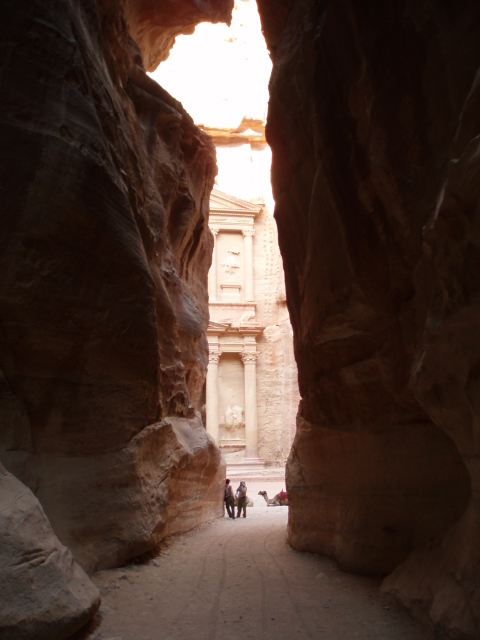 This turned out to be a brilliant idea as Petra is one of the most incredible places on earth. I’d go so far as to agree with the dude that said everyone should go and see it once before they die. 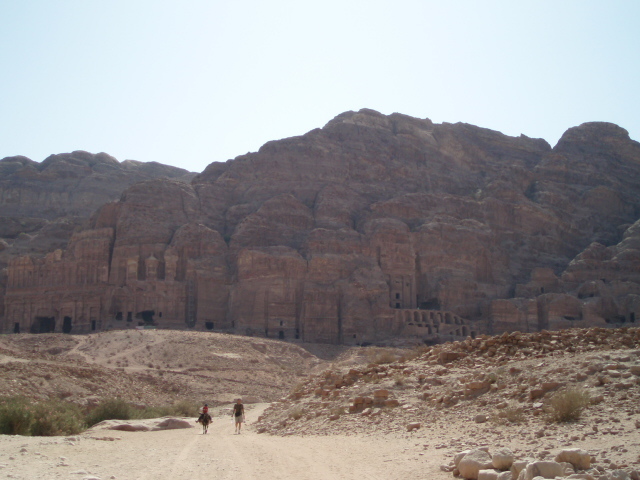 It is essentially an entire (ancient) city which has been carved into the mountain rock. Yes, INTO the mountain rock. It is bizarre, awe-inspiring, magnificent and simply astonishing. 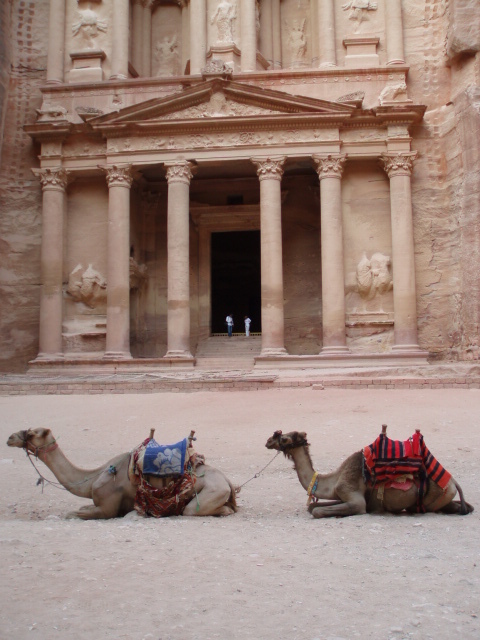 This city was created about 2100 years ago by a nomadic Arabic tribe called the Nabataeans, who liked the place so much they stopped their wandering ways and set up shop for a while and they created some spectacular architecture. I promise you the pictures do not do this place justice. It’s breathtaking. You get to the site itself by walking through a canyon called The Siq which is basically a meandering path surrounded by a rock face on either side reaching up to heights of more than 200 feet. It twists and winds for 1.2km before opening up to the most famous Petra ‘building’ known as The Treasury (no-one seems to know why it’s called this, it just is). The full site is absolutely enormous (of course, being the remains of an entire city), so if you are feeling lazy you can jump on a horse, camel or donkey and see it that way. And the entire time we were there, we were harangued non-stop by offers of a ‘cheap’ ride on one of these animals. You’ll be pleased (and perhaps not a little surprised) to hear that we decided to walk it. Oh yes, when I decide to be a tourist, I do it right!! So we walked. For some inexplicable reason I had made the choice to forego socks on putting on my sneakers that morning. Let’s say right out in the open that this turned out to be a monstrously bad decision. Foolish even. I especially thought so after climbing the 862 rocky steps up a friggin’ mountain in 40C heat to see “The Monastery”, another carved building. This upward journey took about an hour and when we got to the top my legs felt like jelly and my feet were on fire. Fun times! But you know what? We WALKED!! On our way down, nearly everyone we saw on their way to the top was riding on donkeys. Poor little donkeys. Anyway, the way down is when the blisters started to hurt. Which is when I remembered that we’d packed my socks in our daypack. Lucky because by that stage I could barely take a step without all seven (yes seven) of my blisters causing me great grief and a fairly healthy dose of agony. The socks helped. “No, but thank you anyway, bye now”. Towards the end of our day it went a little more like this. One absolutely beautiful girl of about 12 gave me some colourful rocks and didn’t seem to be selling anything. She followed us around for a while and after a few minutes of chatting to her, she told us she loved us. Awww, of course she did, who wouldn’t? Anyway, we loved her too. We gave her 1 Dinar to let us take her picture. Her name is Rania (the same name as the Queen of Jordan – worlds apart but just as beautiful, if not more so). All the children we encountered seemed like street kids and we realised they were Bedouins – nomadic Arabic gypsies that tend to live in tents in the desert. I guess they’ve adapted their survival skills to include sucking up to tourists for cash. A little later on, another young girl, on a black donkey called Michael (a good Islamic name), tried to give me a similar rock but when I politely declined she threw it at me. Charming!!. Suffice to say I didn’t buy anything from her. After a long day walking around the Petra site in the soaring heat (able to only occasionally steal furtive sips of water, away from the eyes of thirsty, fasting Muslims) we were exhausted. We should have gone back to the hotel, put our aching feet up and stayed there but we’d already bought tickets to an event called “Petra By Night” so we went back after darkness fell to once again walk the 1200 metres through the Siq, which this time was illuminated with over 1000 candles. Though we were tired, it was worth it. It really was beautiful and serene. At the end of the Siq, the Treasury was also lit up with hundreds of candles (no pics as I forgot to take my camera – I was tired alright!!). We were treated to two musical performances on Arabic instruments and also a lovely cup of mint tea. Most civilised. We slept deeply that night.